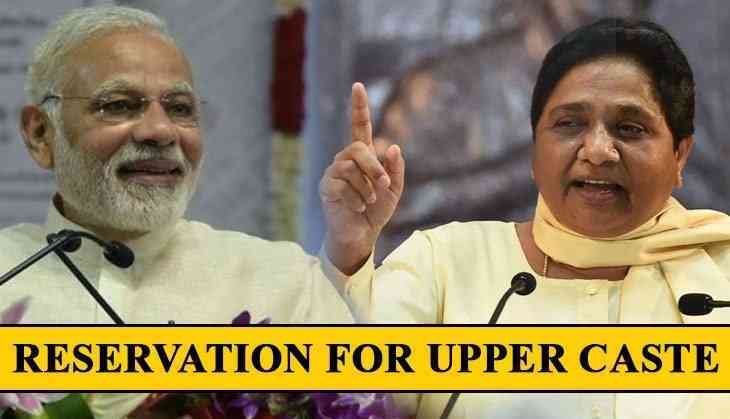 As the BJP government played its final masterstroke by giving 10 % reservation quota to the Upper Caste, BSP’s Mayawati has issued statement is support of the bill but has questioned the intention of the government. The BJP government has yesterday granted 10% reservation to the economically backward Upper caste in a move to influence its core voters ahead of the Lok Sabha polls. The Congress also raised the issue of intention of the government saying that at the end of last session in Parliament, what was the hurry to bring in the bill. The government will place the Reservation Bill in the Parliament today and wil try to pass it as today is the last day of the session. The Rajya Sabha session has been extended till Wednesday so as to pass the bill ahead of polls. Although, the history of such reservation dates back to 1991, when then Prime Minister P.V Rao had brought reservation for the Upper castes in the economically backward section but the Supreme Court had scrapped the said bill, stating that one can’t mix the caste and class of society, and eventually the debate of creamy vs non-creamy layer crops up. Also, it was breaching the limit of 50% quota set by the apex court for reservations.